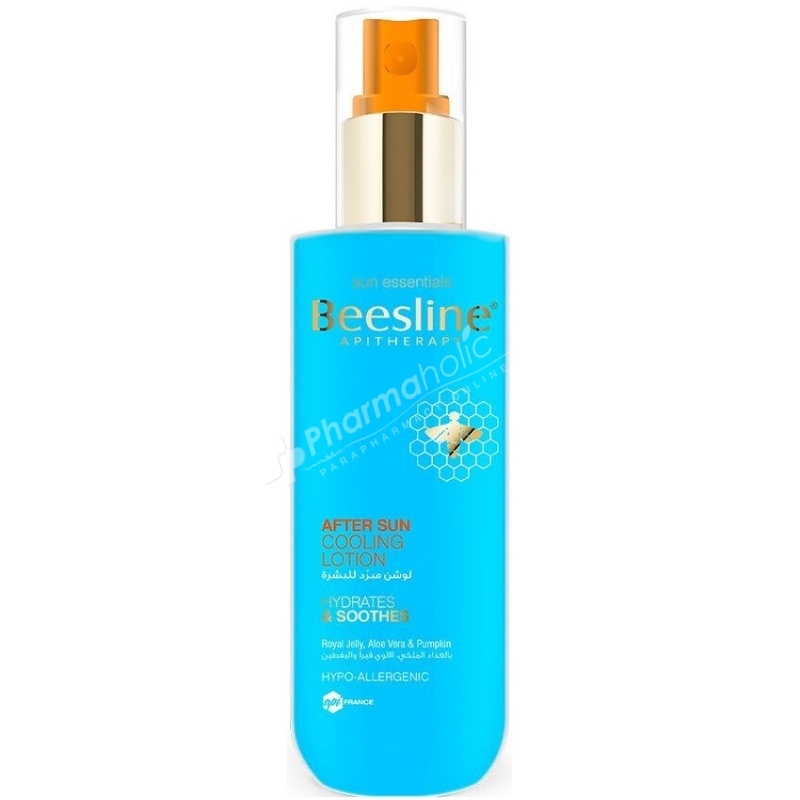 Beesline After Sun Cooling Lotion soothes & refreshes skin. Hydrates & regenerates it. Aloe Vera & Pumpkin juices quench skin's thirst and sooth redness, regenerating skin tissues. Royal Jelly nourishes & seals sun burnt damaged skin. Vitamins B5, C & E are powerful antioxidants, they protect skin from premature aging due to sun damage. ROYAL JELLY is the milky-white waxy substance secreted from the glands in the hypopharynx of worker bees and is fed to the larval bees. Highly nutritious, Royal Jelly regenerates the cells and tissues leading to an increased collagen synthesis for tighter, firmer skin. PUMPKIN (Cucurbita Pepo) contains high concentrations of nutrients and potent anti-ageing properties due to its richness in antioxidant beta-carotene and phytosterols. The presence of a highly efficient proteolytic enzyme that dissolves dead skin makes it perfect for healing burns and wounds. Apply generously to the face & body after sun exposure. Reapply as often as desired to increase the skin's moisture levels effectively. Pair with Beesline After Sun Repairing Milk for an ultra-soothing experience. AQUA. VEGETAL GLYCERIN. ALOE BARBADENSIS (ALOE VERA LEAF JUICE). OCTYL METOXYCINNAMATE. CUCURBITA PEPO (PUMPKIN JUICE). TOCOPHERYL ACETATE (VITAMIN E). PANTHENOL (PRO-VITAMIN B5). L ASCORBIC ACID (VITAMIN C). ROYAL JELLY. MINTA PIPERITA (PEPPERMINT OIL). LEVULINIC ACID. SODIUM LEVULINATE. XANTHAN GUM. PEG-40 HYDROGENATED CASTOR OIL. PARFUM.